Dr. Reitsma received his BS in Biology from William Paterson University in 1985 and his PhD. from Dartmouth College in 1990. 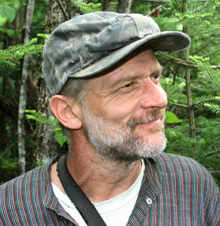 He is an avian ecologist and has conducted research on bird populations since 1986. Dr. Reitsma has worked on American Redstarts, Black-throated Blue Warblers, Yellow-shouldered Blackbirds and Northern Waterthrushes in the Caribbean. In 2003, he started a continuous population study on Canada Warblers in Canaan, NH, his home town. Graduate students working with Dr. Reitsma conduct research in the field on populations and communities of vertebrates in New England and abroad. All of his work is collaborative with either graduate and undergraduate students or colleagues. He enjoys his family, the outdoors, travel abroad and bird-watching. He also likes to play and listen to music of all types. Burns, C., L. Reitsma. 2018. Rapid Assessment of Breeding Productivity, Demographics, and Habitat Suitability of the Canada Warbler (Cardellina canadensis). In review. Journal of Field Ornithology. Reitsma, L., C. Burns, and J. Sullivan. 2017. Black capped chickadee (Poecile atricapillus) feeding Hermit Thrush (Catharus guttatus) nestlings. In press. Conrod, Christopher A. and Leonard Reitsma. 2015. Demographic responses of myomorph rodents to a pulsed mast production in a northern hardwood forest. Northeastern Naturalist 22(4): 746-762. Goodnow, Marissa, and Leonard Reitsma. 2011. Nest-site selection in the Canada Warbler (Wilsonia canadensis) in central New Hampshire. Canadian Journal of Zoology: 89: 1172-1177. Dr. Reitsma carpools in his car that runs on waste vegetable oil, he heats his home 70% with wood from his own forest, produces about 70% of the electricity his family consumes with solar panels, keeps laying hens, and eats about 70% locally produced organic foods. He loves birds and being in the forest year-round.